A big part of getting ready to go to Antarctica is getting Physically Qualified ("PQ"ed). Every participant in the US Antarctica Program has to go through this, whether they are an employee like me or a grantee. The reason behind this is of course is of course that hospitals are a long way away from The Ice. There is a doctor at each US station but the equipment and supplies for dealing with a serious health problem is very limited. Medical evacuations are possible in some circumstances but always take time and huge amounts of resources. The better approach is just to send healthy people. So, I've been diligently going to all of my doctor's appointments for the past two months. I've been to my dentist, my family practice doctor, my optometrist, the blood test lab, and the urine test lab. And today it was a big relief to get word that all of the required paperwork has been received in order. I'm officially PQed ! This clear the way for my travel arrangements to be made to Punta Arenas Chile and to the continent. And training to be useful.. In small communities everyone has to fulfill multiple roles. So, at Palmer, with only 35 people, everyone has a lot to do. In addition to my usual job doing research, I'll also be help in times of emergency as part of the fire fighting squad and the ocean search and rescue team. To get ready for these extra jobs, I flew back to Colorado to meet some of the other people who will be going down to The Ice with me. 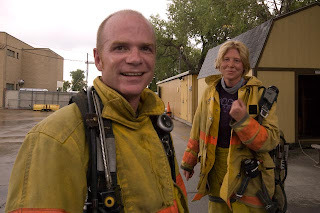 We spent one week at Red Rocks Fire Training Academy in Arvada. At the Academy the first thing we did was get familiar with the fireproof clothing firefighters wear -fireproof pants, jackets, gloves, suspenders, hoods, helmets and boots. Then we were issued air packs called Self Contained Breathing Apparatus (SCBA) that allow firefighters to enter smoky rooms. These are nearly identical to SCUBA equipment. Wearing all this gear is cumbersome and hot !! We were sweating buckets before we had even started doing enything. 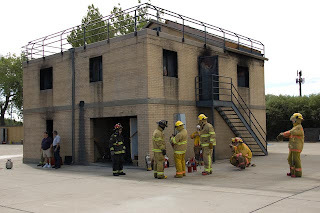 After we had all our gear we were introduced to the concrete fire house. The number one job of firefighters is to search for missing persons and quickly get them out of danger. But the rooms that firefighters enter may be filled with heat and smoke, meaning they can't stand up or see. 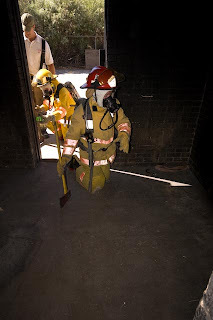 So we learned how to crawl along the floor with our masks blacked out, sweeping along the floor with a fire axe and testing the floor and walls as we went. This may sound easy but it was a lot of hard work ! Once we got pretty good at practicing without fire, the instructors set fires though out the building. Moving through a burning building is scary - every part of your brain is shouting "get out of there". 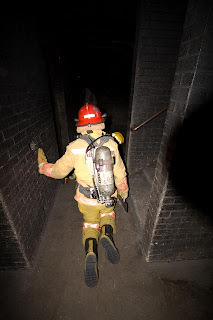 I enjoyed the drills though; once I got used to breathing through the SCBA mask and trusting that my clothing would block the heat, I relaxed and focused on getting the job done. We also learned how to hook up and use fire hoses, a lot of fire theory and practiced our team work skills. Knowing we can count everyone on the team will be very important at Palmer. We all have different roles to perform. 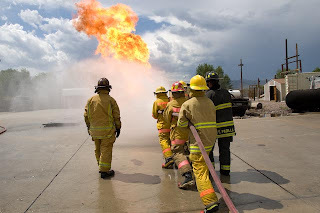 I'm the marshall of the team so I need to understand not just how to do the fire fighter job but also what its safe to ask other team members to do. By the end of the week we weren't professional firefighters but we were pretty confident amateurs. 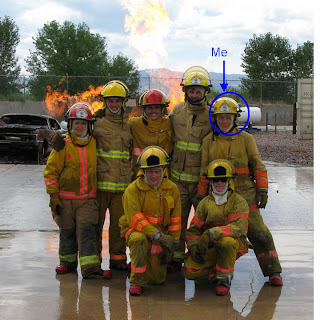 In the team photo below, look at the flames. Those gasoline fires were burning about 900 deg F and where we were standing it was several hundreds degrees. Hot work ! 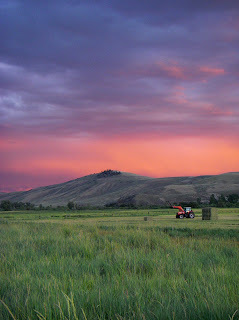 The week after fireschool, eight of us went to Gunnison CO for training in ocean rescue and searches for missing people. 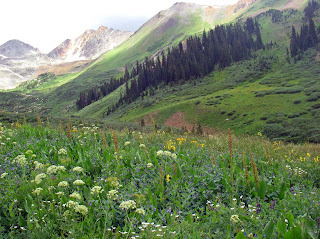 We had one free day so three of us spent the day hiking and taking photos in the nearby mountains. During the week at search and rescue school we practiced searching for lost persons and pulling victims from the water. 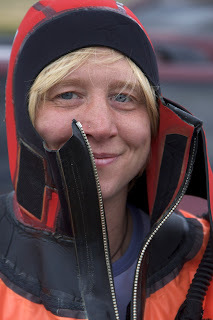 The orange suits are cold water immersion suits that we'll wear if we ever have to abandon ship in Antarctica. They are "one size fits all" and seal with neoprene gaskets around the wrists and neck. Getting them on is a challenge but floating around in the water with them is fun. 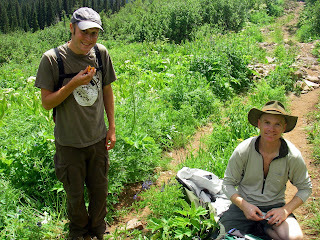 On the final day we had an all-day search exercise, looking for a "lost person" in the surrounding mountains. The lost person turned out to be a small doll, whom we came close to but never found. 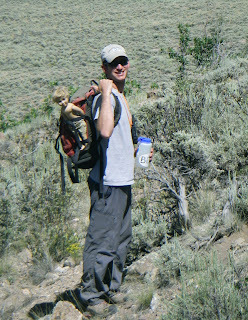 The photo is my search partner Jon with the doll at the end of the day. When we're actually using these skills in Antarctica it will be a lot colder than it was in sunny Colorado ! However I think the skills will transfer over. Deployment to Palmer is getting closer, just a few more weeks until I leave !